Your engine coolant has one of the toughest jobs under your hood. Today’s cleaner-running, more fuel-efficient heavy-duty engines require a coolant that performs under higher engine operating temperatures and faster coolant flow rates. Not only does the coolant have to help maintain the right engine temperature. It must also protect your cooling system components from damage and corrosion. And it’s expected to do all of this in tough work environments over a longer coolant service life. Good news. 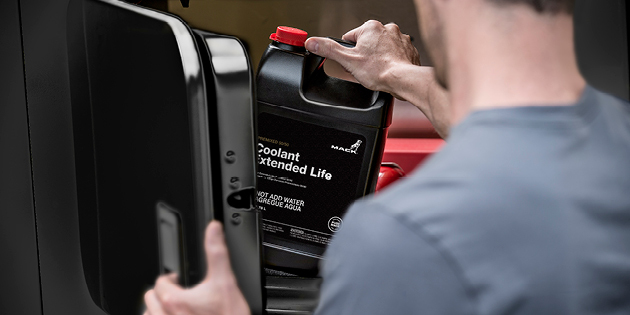 There is a high-performance coolant that’s specially formulated for your hard-working Mack® Truck engine – Mack Extended Life Coolant (ELC). Mack ELC will protect your heavy-duty engine from summer heat and winter freeze for up to 750,000 miles – more than double the service life of standard coolants. Long-term corrosion protection for aluminum, brass, cast iron, steel, solder and copper alloys. Longer service life for water pump seals. Excellent protection against pitting of wet sleeve cylinder liners. Reduced hard water scale and excellent hard water stability. Even a top-performing coolant like Mack ELC needs regular maintenance to do the best job for your hard-working truck. Mack ELC comes prediluted 50:50 with high-quality water, and that’s the way it should stay. If you top up your coolant, use Mack ELC, and if you add water, it should be deionized or distilled, never well water. Drive with cooling system confidence by having your coolant checked regularly by a Mack-certified technician who will use a refractometer to make sure it has the right composition and balance. Mack ELC, in its distinctive red color, protects without the need for additives or extenders that are required when standard green coolant is used in heavy-duty applications. And Mack ELC’s advanced silicate-free, phosphate-free formula delivers maximum heat transfer properties. For more information or to schedule a service appointment, call the coolant experts at your nearest Mack dealership. Fleet managers: Take advantage of the protection, versatility and longer service life of Mack ELC. It meets or exceeds the requirements for all heavy-duty and stationary engines. Save time, get quick delivery and find regular specials when you order online with SELECT™ Part Store.